It was a blessing to have Taiwan and his wife, Sokang, dedicate their newborn baby son to the Lord during our Phnom Penh Sunday morning service. It’s a blessing to see how this young family is growing in the Lord. Taiwan works as a private chef for a wealthy family and Sokang is able to stay home with their three children. Please pray for Taiwan and Sokang to continue to live for the Lord and lead their family in the right path. One of the most important aspects of ministry for the missionary is investing in training the next generation of young leaders. God has blessed us with so many young people here in Phnom Penh as well as in the village works, and we know that they must be challenged to develop the skills God has given them for His glory. Young people generally have tender hearts and are eager to serve the Lord if they are properly led to do so. Every couple of months we have a special Sunday night service that is led entirely by the teens. This past Sunday evening was one of those special services. 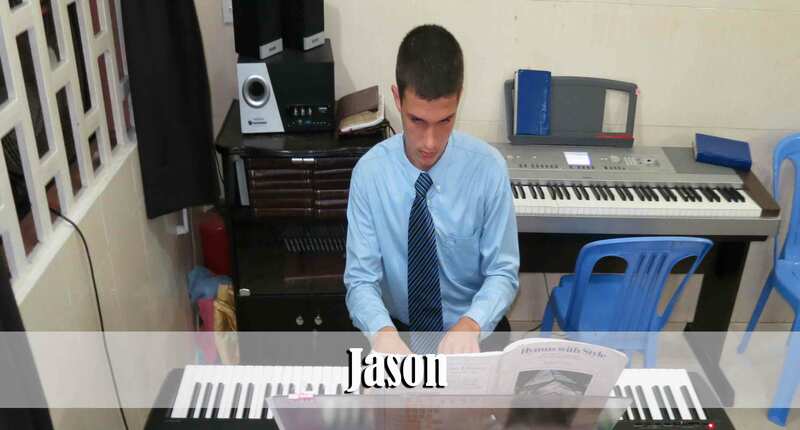 Jason, our youngest son, has really been diligent in practicing the piano and has been helping play the second piano for Sunday night services now for a couple of months. This past Sunday evening he played an arrangement of “Fairest Lord Jesus” as a solo. He did a flawless job and we are blessed by his diligence and desire to do his very best. 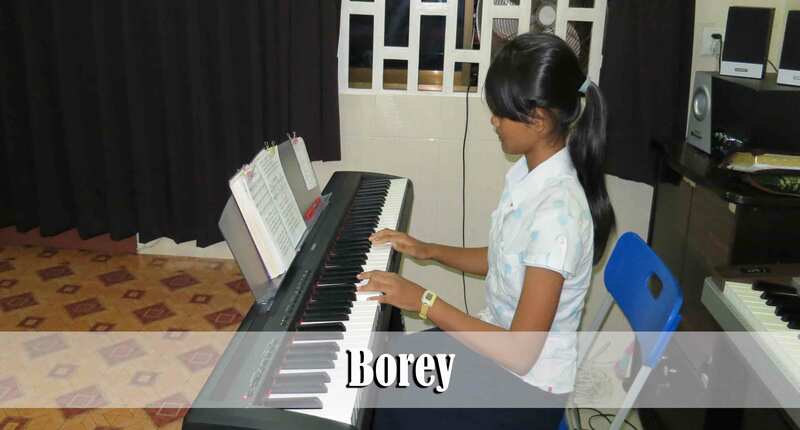 Debbie has been teaching Borey the piano for several months now and Sunday evening was her first time to play a special in front of the church. She did a wonderful job. It was evident that she has been working very hard to learn the song. We are so blessed to see her love for the Lord and her desire to live for Him. Borey and her mother were reached with the gospel through one of the national soul-winners here at our Phnom Penh church. She has lived here at the church since her mother went home to be with the Lord a year ago, due to the fact that her father is not living a lifestyle that is suitable to lead and guide her. We are blessed to see her love for the Lord and her desire to honor Him with her life. Please pray that her father, Rom, will be saved. SreyNick, 18 years old, came to faith in Jesus Christ after I had the opportunity to reach her father, Sinath, with the gospel. She has been taking piano lessons from Debbie for almost a year and a half. Sunday evening was her first time to help play for the congregational singing. I know that she was nervous but she did a great job. Her father used to play guitar in a worldly band before he was saved. He has told me on several occasions that he regrets all the years that he wasted his life in the world before he came to know the Saviour. 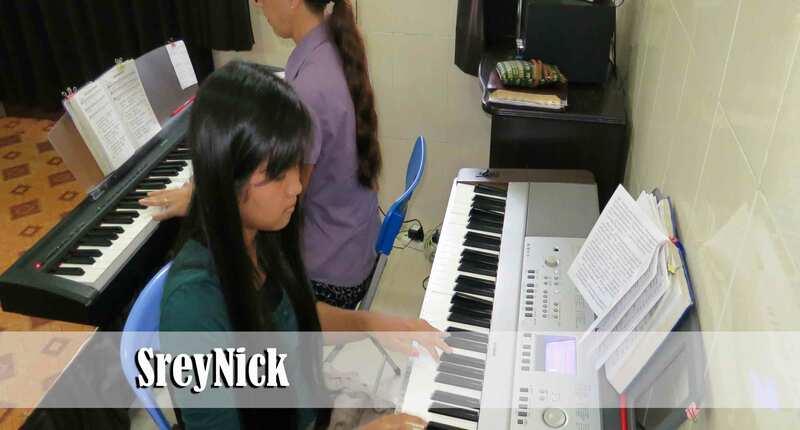 I know that he is blessed to see that his daughter uses her musical abilities to bring glory to the Lord. 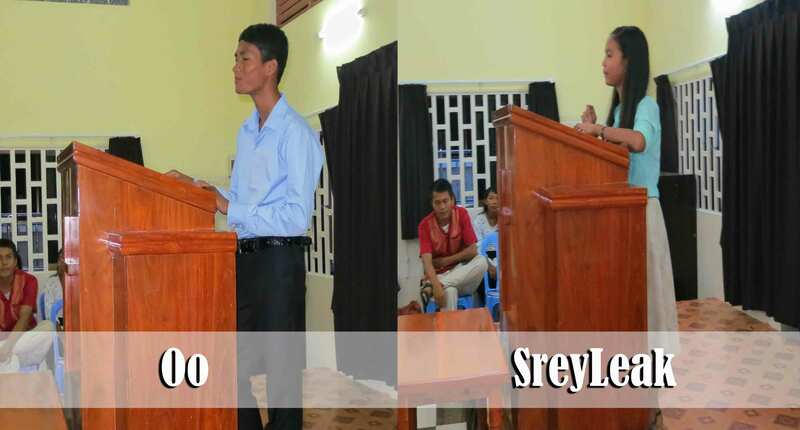 Oo and SreyLeak were both reached with the gospel through our Phnom Penh Children’s Ministry. When we started the Children’s Ministry three years ago we started it with three purposes in mind: 1) To reach children with the gospel, 2) To see the children grow in the Lord and become a part of the “mainstream” of our church, and 3) To afford an opportunity for the nationals to develop a burden for their own people as well as learn how to lead, teach, and preach. We are so happy to see that each of these goals are being fulfilled. Sunday evening Oo handled all the announcements as well as moderated during the time that we open up the floor for folks to share blessings from the past week. He is developing boldness and we are so happy to see the growth that has taken place in his life. SreyLeak gave a ministry report on the nursery ministry and she did a wonderful job. Both of these young people are the only Christians in their family and their life is not easy. Please pray for them to continue to grow in their walk with the Lord. Veasna and Buth were our preachers for the Sunday evening service. 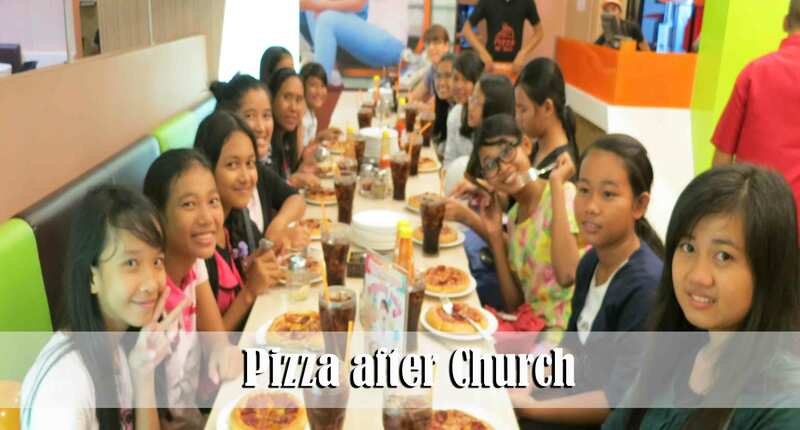 It has been about 8 months since Veasna preached for a regular church service. We were so amazed to see how he has grown in his ability to preach. Veasna was reached with the gospel through the Children’s Ministry. He is the only believer in his family and is trying hard to be a consistent testimony in his home and neighborhood. He has become one of our regular preachers for the Phnom Penh Children’s Ministry and it is evident that God has gifted him with the passion and ability to boldly preach to his own people. We thank God for his example! Buth was reached with the gospel through one of our members who, at the time, was his English teacher in a private school. Buth is the only Christian in his family as well. He did a great job of communicating his message. 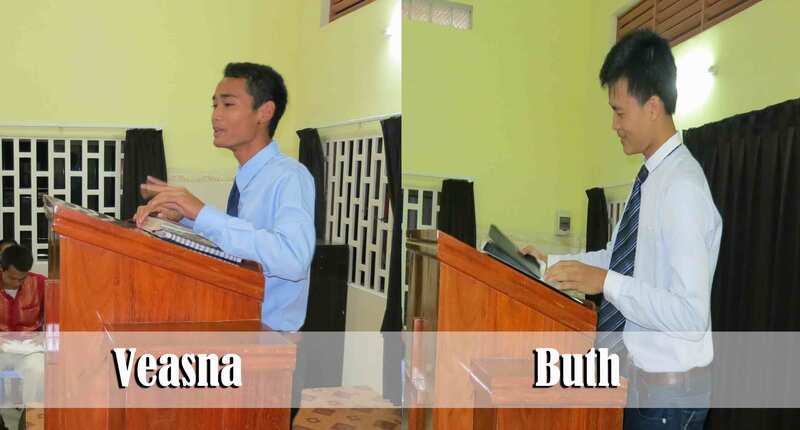 Buth is a young man who is especially eager to learn more of God’s Word. He is also very consistent in expressing his gratitude each and every time someone does something nice for him.I know that God has special plans for Buth’s life. Please pray that Veasna and Buth will continue to be concerned with the things that concern God – namely living lives that glorify Him and that fulfill His purposes for their lives. It was fun to be able to spend a little time in fellowship with some of the faithful Phnom Penh teens after the Sunday evening service. Brother Torres did a great job of planning this activity and all the young people had a great time. The young man sitting in the middle (in the blue shirt) is named Dy. He is the older brother of one of our faithful teen girls. He accepted Christ as his personal Saviour this past Thursday. 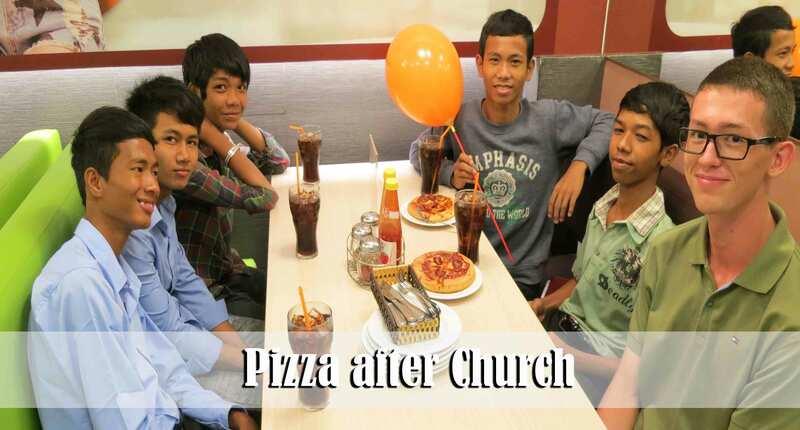 Please pray that Dy will get plugged into the church and grow in his new faith. 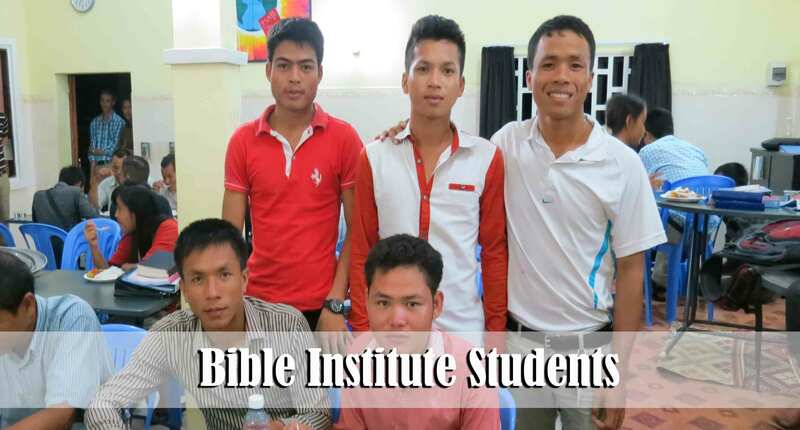 We resumed Bible Institute classes this past Monday after taking about a six week break. It was great to have three new young adult men join. Sophal (red shirt) was reached with the gospel through his brother, Vuthy. 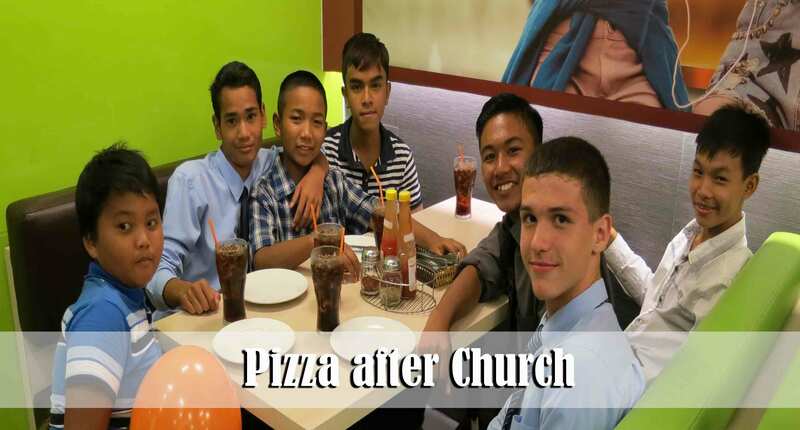 Zen (red and white shirt / standing) has been saved less than a month and is the 24-year old son of one of the faithful families in our Anlong Tnout church. Ra (read shirt / sitting) has been saved only a few months and is the younger brother of one of our very faithful ladies in the Anlong Tnout church as well. Please pray for Ra’s wife, Pich, to be saved. We were thrilled to open this semester with 40 students in the institute. This semester we are offering two classes: 1 Corinthians and the book of Proverbs. There are others who want to study as well but who are unable to due to conflict with their schedules. I am able to meet with another 3 folks at another time during the week and teach them the 1 Corinthians lessons. It is my goal to finish 1 Corinthians chapters 1-7 before Christmas. We will see how that goes. This next week I hope to begin writing the curriculum for 1 Corinthians chapters 8-16 which we hope to teach in 2015. Some of you have asked about Srey Leak. (not the teenager Srey Leak) You will recall that a few months ago she was forced out of her Muslim village because she became a Christian. She sought refuge here in the city and she has been doing well. This past week she and another lady in our church started a small fruit and vegetable stand down the street from the church. You will notice that she sells meat as well… Hint – if you plan to buy meat from her make sure you get there first thing in the morning!! This is how she hopes to be able to support herself and her son. Debbie and I meet with her for a time of discipleship each Tuesday morning at 9:00. When I asked her how she was doing with her Bible reading now that she has started her business she told me, “I’m doing fine. I get up at 3:00 a.m. so that I make sure I have time to read my Bible and pray before I start my day.” Not bad for a young lady who has been saved less than 6 months! I wonder how we would answer that question if it were posed to us? I LOVE HOW GOD IS WORKING WITH THE SPIRITUAL GROWTH OF YOUR CHURCH. GOD IS SO GOOD TO US. HE KEEPS ME GOING , GROWING IN MY LOVE FOR HIM. I APPRECIATED THE PEOPLE UPDATE YOU HAVE SENT. HAS GOD PROVIDED A VIET NAM PERSON TO HELP YOU? I ASKED PASTOR CERVI ABOUT YOU COMING TO VISIT FAITH BAPTIST CHURCH HERE IN SILVER SPRINGS, NEVADA. I THOUGHT HE SAID YOU WERE COMING IN DECEMBER. YAAAAA!